The electric sander is not mandatory, but it is useful to be able to finish beautifully in DIY. This photograph is mini electric Sander of Ryobi. It is very small and finds it useful in woodwork's finish. Polish is deleting a surface portion and making it smooth by rubbing the solid surface using the solid whose hardness is higher than it. In order to grind wood, the sandpaper turned off to Sander at the rectangle is attached, and unevenness of wood is lost. Efficiency will be improved by polish work, if Sander is used rather than grinding by hand using a sandpaper. This model can attach a sandpaper to Sander directly. Although it is difficult for an amateur to delete a big field by a power planer, if electric Sander is used, it will not become a result like a power planer, but for appearance, smooth finish is possible. The sandpaper of #40 - #60 is attached to electric Sander, and it grinds roughly. And if the sandpaper of #120 - #240 is attached and ground, it will become a result like a power planer. Although mini electric Sander is compact, I think that workability is very good for small woodwork. That is, a work is pressed down single hand and Sander can be operated single hand. Although fundamental polish capability is inferior to the thing of ordinary standard size, there is a made advantage which is operated single hand. Electric Sander roughly divides into an orbital sander and random sander. A polished surface is a quadrangle, and an ordinary sandpaper can be cut and used for an orbital sander. Since a sandpaper can be obtained at a low price, it is economical. It seems that polish capability is small compared with random Sander. Random Sander has a form where a polished surface is round, and uses a circular sandpaper for exclusive use. Although it is more powerful than an orbital sander, since a sandpaper for exclusive use is expensive, it is uneconomical. 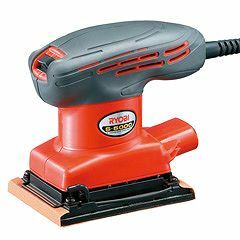 Although electric Sander is convenient, many fine dust's coming out and the thing with which a sandpaper is easily got clogged are faults. Although the dust should just attach a dust separator, it is troublesome. It is a fault by which the sandpaper using paper to a base is beaten easily. It seems that the sandpaper of cloth cannot be torn easily. The efficiency of work will get extremely bad if a sandpaper is got clogged. It seems that the sandpaper which became meshes of a net-like is not easily got clogged.